Quality Time: Cross-country Skiing with Your Loved One. My wife Karen and I have been married for 17+ years. With two beautiful girls, 3 dogs, 2 cats, fish, gerbils, 60 acres, our Wellnesste Lodge business and “real jobs” it’s often difficult for us to spend much quality time alone. That being said, one of our favorite winter “dates” over the years has been to steal away for an hour or two and quietly glide through the woods of Upstate New York. From the Adirondacks to the Tug Hill and beyond, we’ve been fortunate to be able to build beautiful memories Cross-country Skiing together. We’re novices and we stick to novice and intermediate trails while exploring at a steady (but not grueling pace). Our essential gear? We typically pack the camera, some water and a few Clementine’s (our favorite winter fruit from Spain). 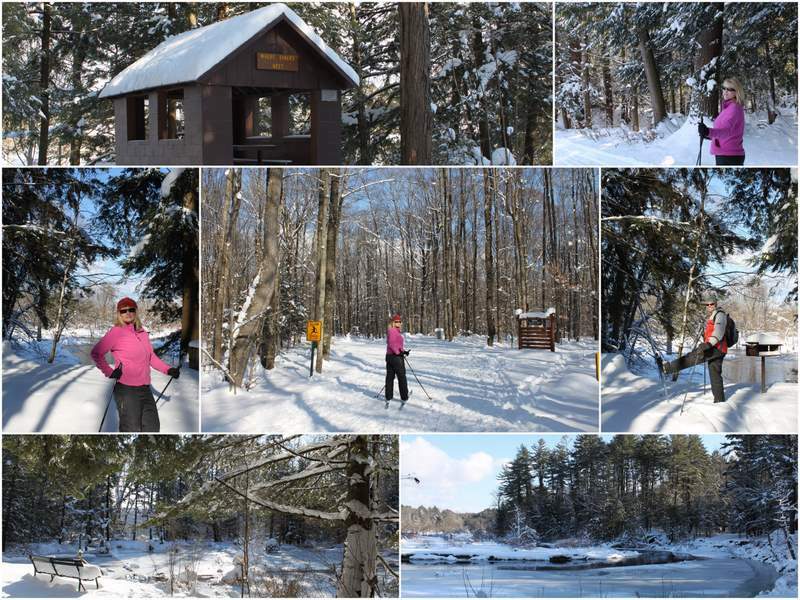 This past Saturday, we enjoyed a XC Ski tour of Forest Park in Camden, NY for the first time. This public park is a little treasure with mature forests and a groomed series of trails that meander aside Fish Creek & Mad River. The new fallen snow on the Eastern Hemlocks and Pines along with the babbling of the brooks and rivers in the park were perfect companions on our adventure. We slid along breathing the sweet fresh air. For over an hour we talked, laughed, looked around in silence and recalled other such adventures that we’ve enjoyed in the USA and in Norway dating back over the past two decades or so. It was a peaceful adventure as a couple and the type of “quality time” that all couples can benefit from. The energy of the outdoors, the crisp fresh Central New York air, the bright Vitamin-D evoking sunshine, the chatter of curious Chickadees… all important ties that bind us closer as people and as husband and wife. So… the next time that you’re looking to have some quality time with your loved one, consider getting outdoors on a pair of cross-country skis and enjoying the rejuvenating essence of Upstate New York together. You’ll be delighted that you did.